My Prescription for Anti-Depressive Living offers a window into the life and mind of an extraordinarily creative person who was once told by a pottery professor that he had no talent and should consider another career. Not only did Adler stick with pottery, he transformed it from a dreary, unappealing summer camp craft into a contemporary signifier of modern, handcrafted luxury and became America's first (and only) celebrity potter. Interior designer Bill Sofield has declared, "Jonathan Adler does for American pottery what Noel Coward did for cocktail parties -- he makes life witty, sophisticated, and simply delicious." And now, on a much larger canvas, Adler reveals how you can do the same. 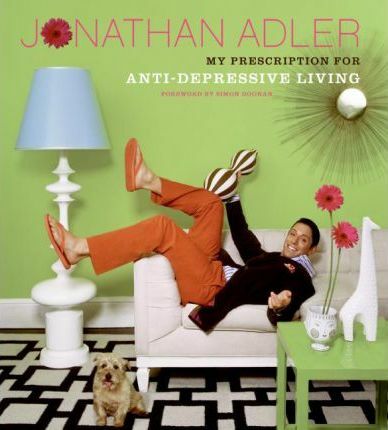 My Prescription for Anti-Depressive Living explores Jonathan's own tongue-in-cheek design "manifesto," with each chapter devoted to a different "tenet," moving through the major incarnations of his interiors and products and ending with the story of his personal creative odyssey. The book is a visual feast, jam-packed with images of interiors and objects for the home, both those designed by Jonathan and those that have inspired him. At the heart of the book are ten of Adler's signature interiors, ranging from photographer Andrea Stern's landmark modernist beach house to the Parker Palm Springs, a desert resort that Adler gave a head-to-toe makeover. Overviews and details of the Parker are prominently featured throughout the book, as are images of the three homes (in Greenwich Village, Shelter Island, and Palm Beach) Jonathan and his partner, Simon Doonan, share with their dog, Liberace, and five other private residences. Part portrait of the artist as a young decorator, part call to armchairs, Adler's much-anticipated literary debut is spirited, provocative, and, ultimately, inspiring. Jonathan Adler was born and raised in New Jersey.